It Is Time To Crown The Ultimate Super Bowl Snack. VOTE VOTE VOTE! 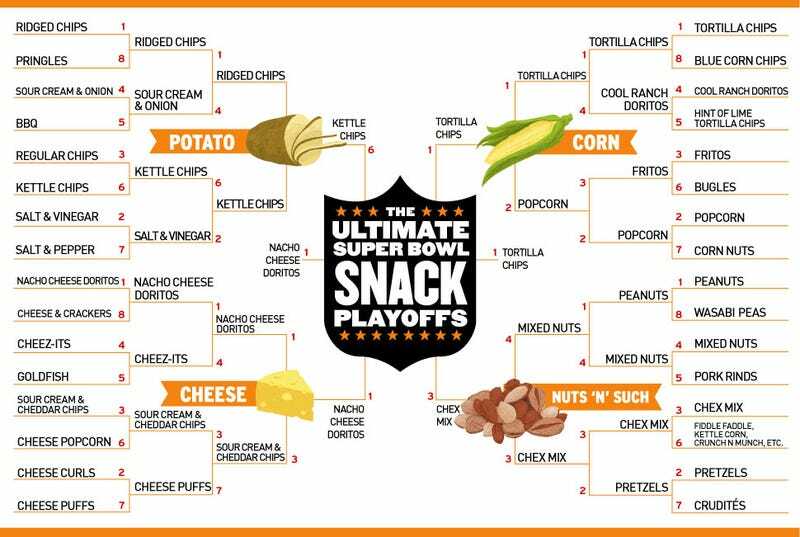 It comes down to this, a battle of the triangular, compressed corn chip: The final matchup in our Ultimate Super Bowl Snack Playoffs pits two number 1 seeds, Nacho Cheese Doritos and Tortilla Chips, against one another. But first! A recap of the Semifinals is in order. In the end, the little Super Bowl Snack that could, Chex Mix, um, couldn't. The combination of cereal, nuts, pretzels, and such was no match for Nacho Cheese Doritos. Sorry Chex Mix! Your consolation prize is that you are delicious. Kettle Chips went down fighting, losing to Tortilla Chips by only 10 percent of the vote. You may have lost, Kettle Chips, but you are loved. Take solace. And now the time has come to crown the Ultimate Super Bowl Snack! Which will it be? The only way to make your opinion known is to vote! (And, right, to scream in the comments section.) So get to that—polls close at noon EST on Friday, at which point we will announce the winner to great fanfare/gnashing of teeth.